American history is filled with epic debates and battles: Madonna and Lady Gaga, Batman and Spiderman, Pepsi and Coke. While those may have no clear winner, there is at least one debate that does have a clear winner. 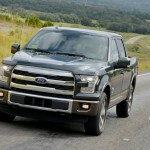 Ford and its F-150 have been atop of the vehicle sales charts for over three decades. This despite the fact that if you pay a visit to nearly any bar in the South you’ll still hear an argument about the virtues of the Ford truck or the Chevy. There are still two sides to this pickup truck debate, the Blue Oval lovers and the Bowtie aficionados. 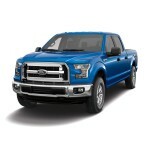 Yet the sales figures don’t lie; the Ford F-150 has been the top seller since Reagan was president . 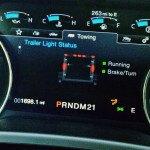 Much of this can be contributed to fleet sales; nonetheless, those who purchase trucks most often choose the Ford. For the longest time we had no understanding as to why the Ford was a better seller. 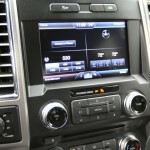 In the last year we had the chance to drive two variants of the Silverado as well as a GMC Canyon and a Toyota Tundra. The Silverado was especially impressive with a great many features and a driver friendly cab that left us wondering why Ford was so special. Well after spending a week with a 2015 Ford F-150 XLT Supercrew 4×4 recently we can now see why, although we still can’t really fully explain why. 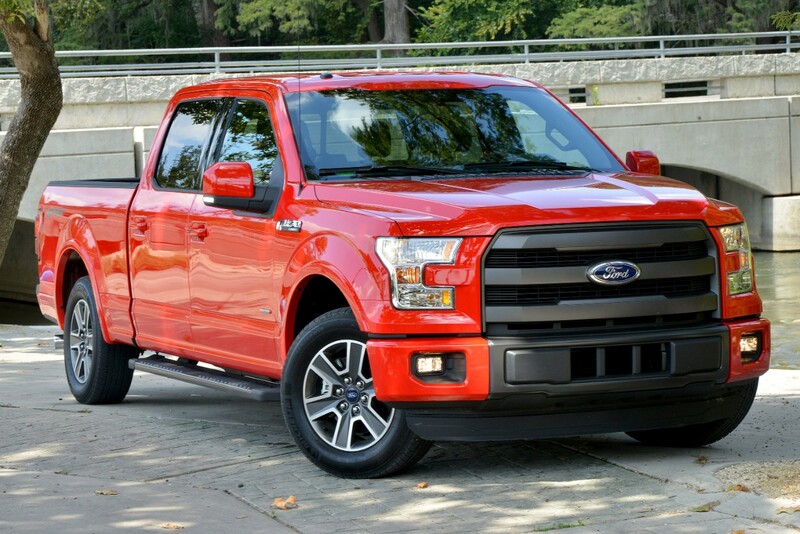 Not content to rest on their laurels, or perhaps sensing that their rivals are creeping closer, Ford introduced a complete redesign of the F-150 for 2015, making this the 13th generation. Among the extensive changes was one that made news when it was announced: The entire body, hood, fenders, cab, doors, bed, tailgate, is now made of high-strength military-grade aluminum. 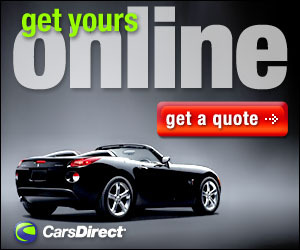 This gives America’s bestselling vehicle a remarkable weight loss; up to 700 pounds in the larger models. 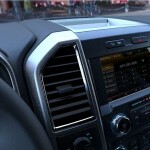 There’s also a new more modern interior and a cornucopia of new features. Five primary trims are available, and include XL, XLT, Lariat, Platinum and King Ranch. Chrome appearance packages are available with XL, XLT, Lariat and King Ranch. Monochromatic sport appearance packages are available with XL, XLT and Lariat. The FX4 off-road package can be added to most four-wheel-drive models. The XL and XLT come in six cab and bed-length combinations and five wheelbase variants. 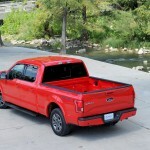 The Lariat is available as a SuperCab with a 6.5-foot bed or an 8-foot bed and the SuperCrew with a 5.5-foot short bed or 6.5-foot standard bed. King Ranch and Platinum drivers have only the SuperCrew cab, but you can choose the short or standard beds. There are four engine options, all mated to a six speed automatic. There’s the 2.7-liter EcoBoost V6 with a new engine design that produces 325 horsepower and 375 lb.-ft. of torque, the 3.5-liter EcoBoost a twin-turbo EcoBoost engine that delivers 365 horsepower and 420 lb.-ft. of torque, a 5.0-liter V8, delivering 385 horsepower and 387 lb.-ft. of torque and 365 horsepower and the 3.5-liter V6 that produces 283 horsepower and 255 lb.-ft. of torque. 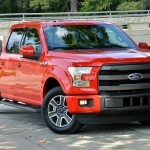 Ford says this new F-150 can tow up to 1,100 more pounds and haul up to 530 more pounds. There are also a bunch of new features available including: a 360-degree camera view that uses exterior cameras to create a bird’s-eye view of the truck to help drivers park, maneuver in tight spots, and navigate narrow roads and trails. There’s also integrated loading ramps, a Trailer hitch assist that adds a new rearview camera feature that incorporates a dynamic line based on steering wheel angle in the display to aid drivers in lining up the truck and trailer with no spotter or need to exit the vehicle. Finally, there is a remote tailgate that allows for tailgate to be locked, unlocked and released from the key fob. The new cabs had a redesign as well. The front doors are shorter by 2 inches allowing for longer rear doors and making rear cab access easier. Inside the front row is 0.8 inch wider inside at shoulder height and 2 inches broader at hip level. 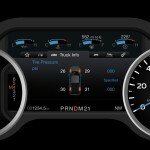 There is also push button start, an 8-inch “productivity” screen between the gauges and 110-volt outlets that can supply 400 watts. LED lighting is everywhere including spotlights on the rearview mirrors. This is also the first year that blind spot and cross-traffic alerts forward collision warning, lane-keeping and adaptive cruise control are available. The first impression after climbing in the cab was a positive one. The seats are comfortable; the cabin roomy; The MyFord touch system is within easy reach on the center console and the controls are clustered together very logically. One thing that noticed right away though was the view. The side window glass extends an inch lower, and the F-150 has a window dip behind the rearview mirrors that now sags an extra 2 inches over previous models. This gives a near amazing outward visibility and a nice open feeling. It was then that we began to notice the differences. 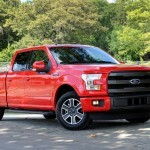 The F-150 has many of the same features of the other trucks we’ve had, not has much luxury as the Silverado High Country, yet the interior of the F-150 just seems friendlier. 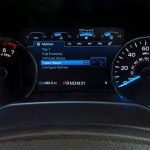 As it turns out Ford uses “human factor engineers”, they’re the ones who clustered the control buttons together for ease of use and used customer feedback for things such as the decision to keep the instrument cluster free of entertainment information. Sure, the other manufacturers no doubt use “human factor engineers”, but the Ford crew seems to have hit the bullseye. This extends to the road as well. The new lighter body powered by the 3.5 liter EcoBoost is far more nimble on the road than the other trucks we tried. The other’s drive like, well, like a truck. 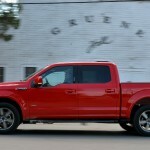 Our F-150 seemed more like a crossover, or a smaller SUV. There was far more get up and go then the others, yet this truck can still tow and haul as much, and in some cases more, than the others we tried. After our week with the F-150, we got it. 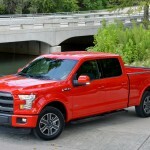 We now understand why the F-150 is the best selling truck in America. As for the exact reason, that is still somewhat elusive; perhaps it’s the ergonomic cabin, the spirited way it drives, or a combination. Whatever the reason, we’re sold. We’ll take the Coke over the Pepsi and if you see us in the a bar we’ll be on the Blue Oval side of the table on this one. Front Head Room 40.8 In. Front Hip Room 62.5 In. Front Leg Room 43.9 In. Front Shoulder Room 66.7 In. Rear Hip Room 64.7 In. Rear Head Room 40.4 In. Rear Leg Room 43.6 In. Rear Shoulder Room 65.9 In. Roadside 5 Yr./ 60000 Mi.